Present Illness: 78 year old right-handed African American man, previously in good health, called his wife from work at 11 a.m. mumbling on the phone and agitated. A fellow coworker became concerned and called 911 at which time the patient was taken by EMS to the ER, arriving at 11:45 a.m. While in the Emergency Room, he was noted to be belligerent, inhibiting basic care such as inserting an IV line, obtaining an EKG, or performing a basic exam. However, an initial quick NIH stroke scale score of 7 was obtained by nursing staff. He was given 2 points for severe dysarthria, 3 points for aphasia, and 2 points for partial right facial paresis. Otherwise, the ER staff reported completely normal strength and gross sensation bilaterally. 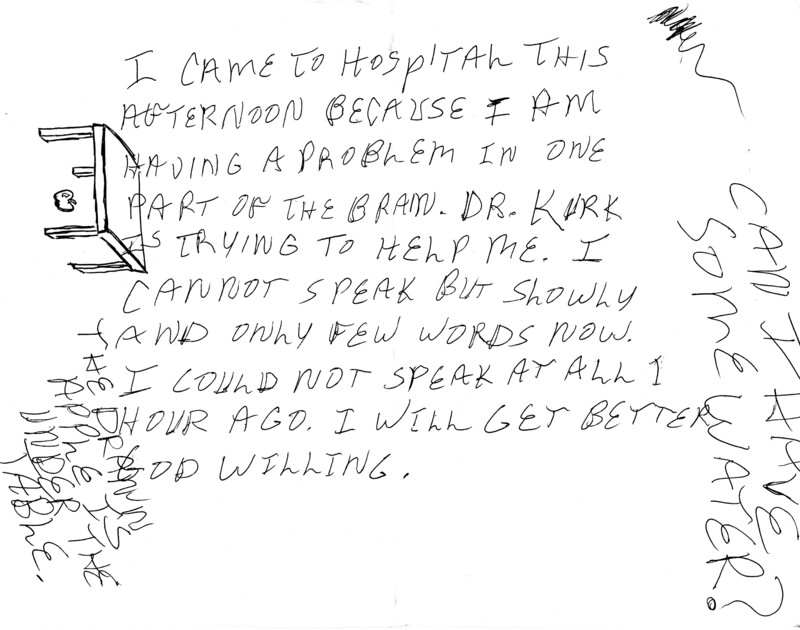 The patient was completely inarticulate on arrival before becoming essentially mute within minutes. He showed much frustration and agitation during his attempts to communicate. He paced around the examination room un-consolable. His wife told the ER staff that the patient was finishing a course of antibiotics. He was also supposed to take a medication for depression, but had not been compliant for "quite awhile." The neurology service was called and arrived to evaluate at noon. Past Medical History: Right-sided Bell's Palsy about 10 years ago; Herpes Zoster infection; Hyperlipidemia (diet controlled). Past Surgical History: Right hip and knee arthroplasty. Medications: ciprofloxacin 500 mg q daily (day 7 of 7 for a UTI); nortriptyline 100 mg q daily, but patient has been noncompliant with this drug. Family History: Father died of heart disease in his 70's. Mother died of metastatic cancer, possibly primary lung cancer after prolonged smoking history. No siblings. Social History: No history of tobacco or illicit substance abuse. He reported heavy alcohol as a young man during college, but since then has only drank socially. He is married, and is a college graduate now working as a manager/salesman in a car dealership. Review of Systems: Denied ever having similar symptoms before. Denied recent headache, dizziness, vertigo, falls, vision changes (such as diplopia/blurring/sudden blindness), hearing changes, taste changes, difficulty swallowing, weakness nor sensation changes in either side of his body/face. Denied history of seizures or recent head trauma. He also denied any recent night sweats, unintended weight loss, recent fever or chills, chest pain or palpitations, shortness of breath. He did report depression but denied suicidal ideation or homicidal ideation. General: Initially very distressed and frustrated per ER staff. However, he was well interactive, attempting to pantomime his communication. Wife was at bedside. Vital Signs: Temperature 97.8 F, Pulse 129/min., Blood Pressure 138/73 mmHg, Respiratory Rate 22. HEENT: Normocephalic, atraumatic, sclera anicteric, nares clear. Cardiovascular: Tachycardic, regular rhythm, distant heart sounds but no murmurs heard. Abdomen: Soft, non-tender to palpation, non-distended, normoactive bowel sounds, with no masses or hepatosplenomegaly. Extremities: Pulses 2+ and symmetric in dorsalis pedis and posterior tibial arteries. No cyanosis, clubbing, or edema noted. Mental Status: Fully alert. At the time of neurologic exam, the patient was fully oriented to self, time, and place. However, he maintained severe, almost incomprehensible dysarthria, making numerous attempts to articulate each answer clearly. He became frustrated and shook his head upon the failed attempts. Speech: Intact comprehension to simple commands such as, "Show me two fingers. Lift your eyebrows," as well as complex commands such as, "If we are in Dallas, show me four fingers, but if we are in Houston, show me three fingers. Touch your left ear with right thumb." Naming of objects per the standardized NIH stroke scale booklet was intact, with heavy dysarthria and self-attempted corrections. Repetition was intact. On attempts at spontaneous speech, no paraphasic errors or neologisms were appreciated, but the patient spoke very slowly, attempting to articulate each word. 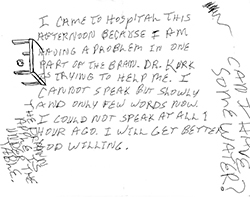 Some sentences showed intermittent dropped articles or linked verbs such as "I am at hospital. I am thankful God's grace." There was no dysprosody, and reading was intact. Patient wrote quickly and was quite surprised at his ease of writing with minimal dropped articles in the sentence structures. V / VII Corneal reflexes intact bilaterally. Facial appearance showed mild right upper/lower facial palsy (which wife confirmed as a chronic feature, and has improved since an episode of Bell's Palsy over a decade ago). IX / X Uvula midline. Palate lifted symmetrically. Gag reflex intact. XII Tongue midline on brief maintained protrusion. Motor: Strength 5/5 in all four extremities, left equal to right, distally and proximally without drift. Reflexes: Tendon reflexes are 2+ and symmetric at the biceps, triceps, brachioradialis, patella, and Achilles. Sensation: Intact to light touch, cold, pin prick in the face, arms, and legs symmetrically. Vibratory sensation intact in the fingers and toes symmetrically. Proprioception was not tested. Coordination: Intact finger-to-nose and heel-to-shin without tremor, dysdiadochokinesis, nor dysmetria. Gait: Independent and stable gait.